Ladies coat by limited collection at marks and Spencer. Back with purple check pattern. Very stylish. Edged in faux leather. Nice pleat detail to lower front. Marks and Spencer check fitted wool coat with belt,size 10,label says 12.Although worn twice, it is new. Selling as it’s a bit snug for me. Lovely funnel neck collar. M&S Colbat Blue Smart Wool Coat. Condition is Used. Dispatched with. 2 nd class. M& S Collection knee-length Jacket Coat Size 14/16. Condition is Used. 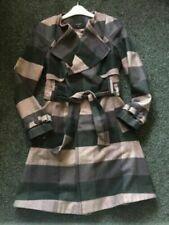 Marks And Spencer Coat, Size 6 Petite. Beautiful and very smart coat. Grey wool-cashmere blend. Used but worn only a handful of times so in brilliant condition. Originally paid £149. Ladies smart wool blend jacket from Marks and Spencers. Black and white patterned. Dry clean only. Black plastic buttons all in place and secure. In good used condition. Please note this is a second hand item which usually has had some wear. Always check all photos before buying. We try to take pictures of all our items in detail and honestly as possible. Please be aware that our postage price will include the sending, packing and delivery of your item, this is all inclusive of your postage price. Thank you for shopping with us today, please check my other items out as you might find something else you like ! Quick dispatch and delivery. UK bidders only. UK 8 EUR 36. 40% Wool, 55% Polyester, 5% Other fibres. M&S autograph navy blue 67% wool single breasted coat size 10, nice condition . Condition is Used. Dispatched with eBay delivery – Shutl 1 day. M&S Marks and Spencer Wool Per Una Coat Long Winter Midi Length Jacket. Label stated size 10. New high heel shoes. Prom, bridesmaid and formal dress. 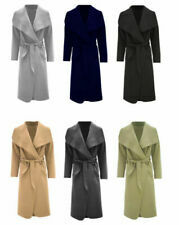 Beautiful knee length coat from M&S autograph range. Size 10. Colour is a dark Khaki green/brown with lovely feature buttons on the double breast and detail at the back. The coat is beautifully lined inside and has a spare button attached. The stitching is all in tact as far as I can see (but sold as seen on the photos). It has only been worn a handful of times. Selling as no longer fits. Can be worn with casual or office wear. RRP £95. LADIES COAT. and is a high quality fabric in a good weight to ensure it always hangs well and is nice and warm, it is plain brown colour., single breasted style with a 4 concealed button fastening. Coat Size - UK 16 Long. Purple Wool & Cashmere M&S Ladies Coat. Condition is Used. Dispatched with eBay delivery – Shutl 1 day. Limited Collection By M&S pure Wool coat. Size 12. Double fronted & belted coat with 2 pockets with brown velvet piping on collar and down front edge of coat. Self patterned buttons. From a pet & smoke free home. Women wool coat M&S Autograph size 14 navy stripe. New coat never worn. Ladies wool mix coat with gorgeous faux silk lining. 25% wool, 26% polyester, 45% acrylic, 3% polyamide/viscose & cotton - dry clean only. I'd say quite a roomy UK 12, oversized UK 10. Marks and Spencer COLLECTION. INSIDE IS GREY. LARGE PATCH POCKETS AND 2 LARGE CONCEALED POPPERS. Marks and Spencer S kirt and jacket - wool blend -jacket size 14 skirt size 12. More of a bright Lemon Yellow to Acid Green. Fully lined. It is difficult to photograph but more like the brighter colour of the photos (it is not a dull yellow). Stunning Boxy Blazer Coat by M&S! Black, white, green & blue houndstooth print. Wool blend. Really well made. Lovely navy silky lining with spare poppers. Two zip pockets. M&S Wool Coat. Armpit to Cuff : 17.5". BLACK PURE NEW WOOL MARKS & SPENCER COAT - SIZE 14. 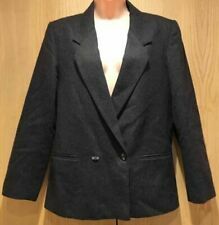 Ladies M&S black wool warm coat with linning inner button fastening uk size 12 armpit to armpit 21" 42" chest knee length shoulder down is 36" this is in very good condition and a bargain buy. Beautiful 50% wool herringbone wrap coat. Belted with inner tie. Collar can be worn open or closed for a different look 42” from shoulder to hem Only worn a couple of times but sadly too small for me now Size 12 petite but as it’s a wrap style with no central fastening so it’s very generous. M&S Ladies Wool Mix coat - Tweed effect - UK size 16. Leather trims around pockets and bottom of sleeves. No wear to the coat. Shoulder to shoulder 17”. length 49”. M&S Black Collared Long Wool Cashmere Coat Size 10 Super smart, structured, stylish coat. Stunning on. This coat will make you feel like a million dollars.